Forget raindrops on roses. THESE are a few of our favorite things! … the Target Dollar Spot, fully stocked. Sure, you think you’re just going to run in and grab some milk and toilet paper, but then those colorful overflowing bins catch your eye, and you know you’ve lost. Don’t worry. Lauren L. totally gets it, and so do we. … when they ask you to read just one more chapter. Building a love of reading is one of the most important things a teacher can do, and we agree with Robyn G. When they beg for one more chapter, you know you’re doing something right. Phil P. loves “the smiles on their little faces when they greet me in the morning.” How can you argue with that? … when they call you Mom by accident. When they mistake you for the person they love and trust more than anyone in the world? Yeah, we agree, Jessica F.D. That’s a good moment. 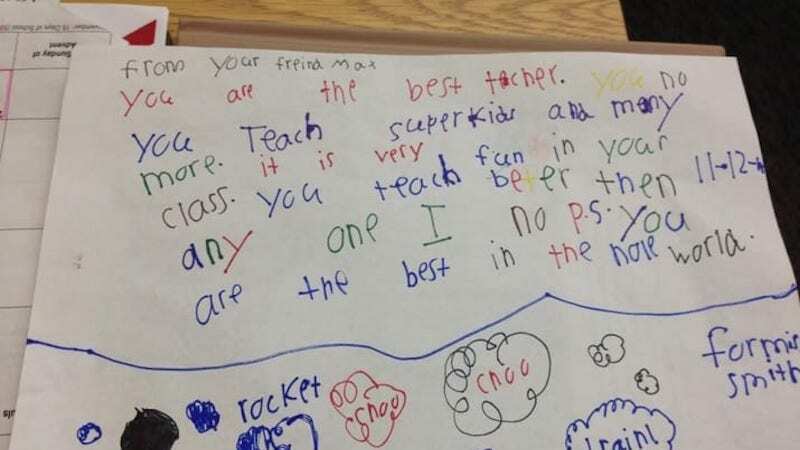 Mary Ellen M. knows the joy of getting a thank-you note from a struggling student, and Krista H. points out they’re even better when they’re handwritten. Elena B. loves it when a parent thanks her for all she’s done for their struggling student. Feeling appreciated just warms the heart. … when they say they love school. … the hugs at the end of the day. Even when their hands are sticky, there’s nothing like a child’s hug, and Linda W. knows it. You know that solidarity you feel when kids are acting wild, you make eye contact with the teacher across the hall, and you give each other a little nod? Yeah, Katherine D.T. does too. Heather R. loves colored pens. Mary W. wants gel pens—new ones. Sheenna Z. prefers Flair pens. Me, I love a good Sharpie. But let’s be honest, they’re all good. … new boxes of crayons and presharpened pencils. Speaking of school supplies, what’s better than new boxes of crayons? Pair those up with presharpened pencils, and your day is made, right, Katie M.? … school supplies you don’t have to pay for. OK, really, school supplies in general contribute a lot to teacher happiness. But when they’re paid for out of someone else’s pocket? Jessica B. knows that’s pure bliss. … when students request you for next year. Matt S. knows the great feeling you get when your reputation precedes you, and that reputation is GOOD. Even better when they’re done by someone else, says Shannon F.R. Bonus points if they’re actually just short plans, and not pages and pages long, according to Jill C.H. Amen! Zoe W. feels you should never underestimate the value of a principal who’s got your back. … when students exceed their own expectations. Michael F.M. knows that every student has potential greatness within, and watching them believe it and achieve it is something to treasure. … when students enjoy learning. 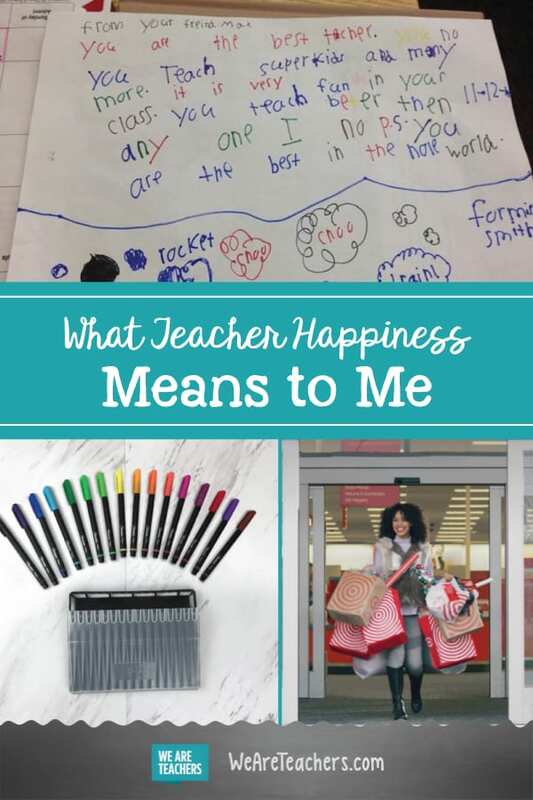 Getting kids to learn how to learn and love doing it, that’s teacher happiness, according to Megan P.
For Shelly S., laughter and learning go hand in hand. A fun classroom is an engaged classroom! … when they actually listen. Ah, that special glow when you give instructions and no one says, “Wait, what are we supposed to be doing?” Yeah, Sandra H. knows that feeling. So many teachers live for these precious moments when all their work at last pays off. “The lightbulb moment … when you can tell they get it!” says Carla V. That’s what it’s all about. … when they tell you how much you matter. What did we miss? Come and share your own teacher happiness moments in our WeAreTeachers Chat group on Facebook. Plus, the eight habits of happy teachers and why teachers quit.